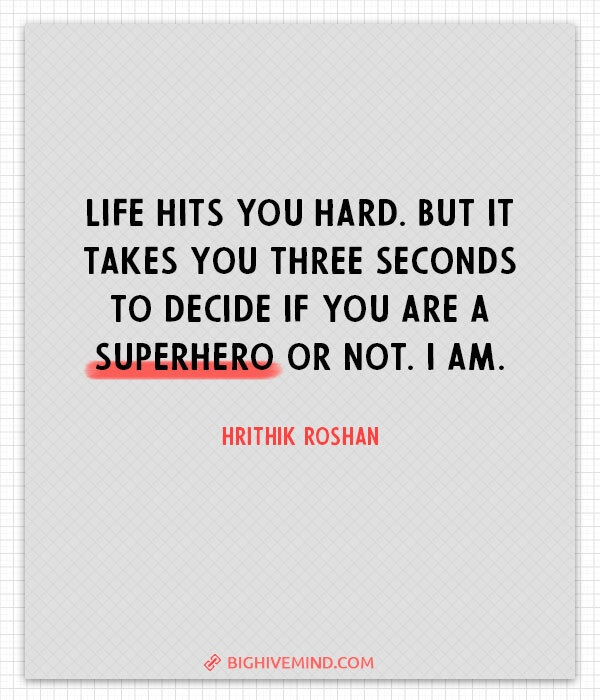 Superhero films are great sources of inspirational quotes. The characters are noble, self-sacrificing, strong, and proud. The themes of superhero films include standing up for others, fighting for justice, and protecting others. A superhero movie can also have a lot to say about relationships, as characters from different backgrounds come together. Loyalty, friendship, and strength are important qualities of superheroes as they fight against evil and work to save the world. Both the Marvel and DC Cinematic Universes are made of awesome films that inspire while they entertain. All of these quotes will remind you of the true values of friendship, justice, and freedom. The door is more than it appears. It separates who you are from who you can be. You do not have to walk through it… You can run. When you decide not to be afraid, you can find friends in super unexpected places. You only have your thoughts and dreams ahead of you. You are someone. You mean something. I hope justice is found here today… before justice finds you. Being a superhero is hard work. You have to save the world. But going to school is even harder. You have to save yourself. Being a superhero is a lot of fun. Whatever life holds in store for me, I will never forget these words: “With great power comes great responsibility.” This is my gift, my curse. Who am I? I’m Spider-man. If there is nothing but what we make in this world, brothers, let us make it good! Women are the real superheroes because they’re not just working. They have a life and everything. I know what it’s like. To not live up to expectations. To feel like nothing that you do will ever be good enough. 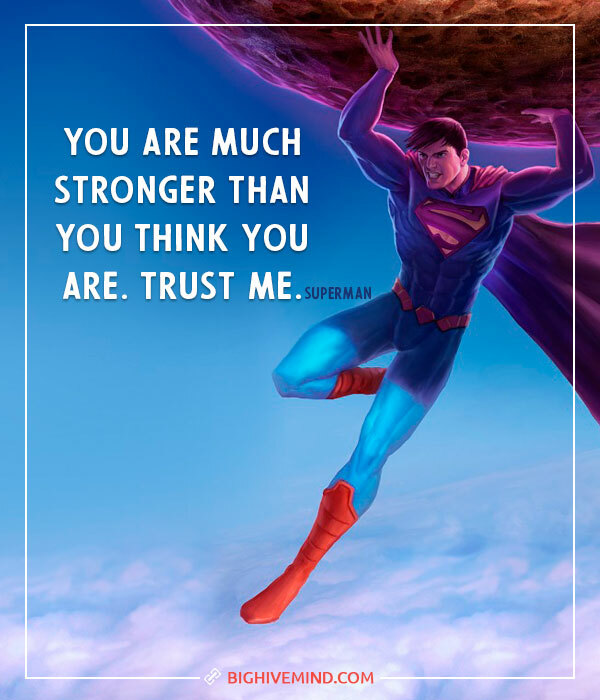 You are much stronger than you think you are. Trust me. We must be careful with our words – we’re like superheroes and words are like our super powers. Super powers should always be used to help others. 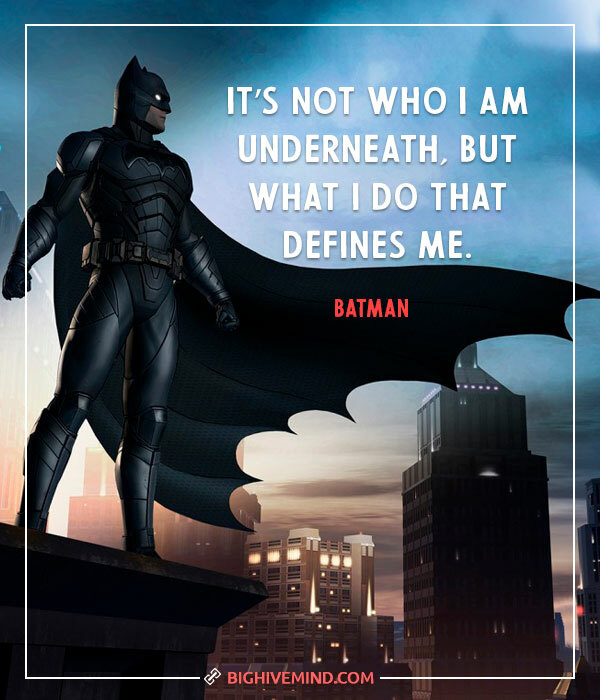 I think you just have to appreciate who you are and hopefully they can see what a superhero is about. That’s my secret Captain. I am always angry! We’ve always known we’d eventually be called upon to open our shirts and save the day, and the superhero was a crude, hopeful attempt to talk about how we all might feel on that day of great power, and great responsibility. A hero can be anyone even a man doing something as simple and reassuring as putting a coat around a little boy’s shoulder to let him know that the world hadn’t ended. It is so important for girls and boys to have a female, strong superhero to look up to. But everybody’s story begins “once upon a time”, and it’s up to us to cherish the time we’re given to ensure we live happily ever after. There is a right and a wrong in the universe, and the distinction is not hard to make. I don’t know how tall I am or how much I weigh. Because I don’t want anybody to know my identity. I’m like a superhero. Call me Basketball Man. Life is locomotion. If you’re not moving you’re not living. But there comes a time when you’ve got to stop running away from things and you’ve got to start running towards something. You’ve got to forge ahead. Keep moving even if your path isn’t clear. Trust that you’ll find your way. We’ve always been ready for female superheroes. Because women want to be them and men want to do them. Listen to me very carefully, my friend: Killing will not bring you peace. Every son’s first superhero is his father, and it was the same for me. 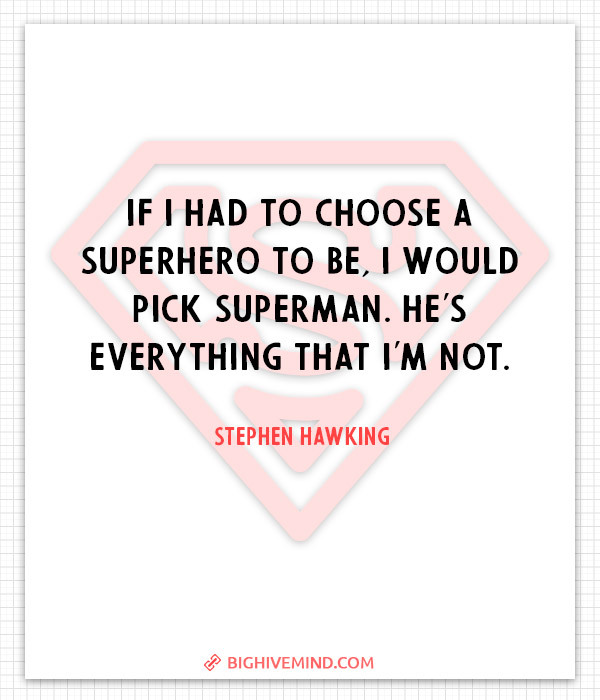 For me, he was Superman and Batman combined. Intelligence is a privilege, and it needs to be used for the greater good of people. Listen, smile, agree, and then do whatever you were gonna do anyway. This isn’t freedom. We’re holding a gun to every citizen’s head and calling it security. A superhero movie is only as great as its villains. A hero can be anyone. Even a man doing something as simple as putting a coat around a little boy’s shoulders to let him know the world hadn’t ended. Sometimes the truth isn’t good enough. Sometimes people deserve more. Sometimes people deserve to have their faith rewarded. Because he’s the hero Gotham deserves, but not the one it needs right now. So, we’ll hunt him, because he can take it. Because he’s not our hero. He’s a silent guardian. A watchful protector. A Dark Knight. No Matter how bad things get, something good is out there, over the horizon. If you cage the best, the beast will get angry. Dreams save us. Dreams lift us up and transform us, and on my soul, I swear until my dream of a world where dignity, honor and justice becomes the reality we all share, I’ll never stop fighting. Ever. Especially in the world of fantasy and superheroes, it’s great to have role models that aren’t in skimpy little outfits, in impossible poses. That’s so important for young women. Violence doesn’t discriminate. It comes as cold and bracing as a winter breeze and it leaves you with a chill you can’t shake off. I have no idea where I’m going to be tomorrow but I accept the fact that tomorrow will come and I’m going to rise to meet it. People see me on the court only as a superhero, grunting and winning. They think you’re a robot, and I’m not. I had my eyes opened. I came to realize that I had more to offer this world than just making things that blow up. Why do we fall? So we can learn to pick ourselves back up. A true hero isn’t measured by the size of his strength, but by the size of his heart. I want to be able to fly like a superhero. I won’t be happy until I can fly across oceans and cities, saving people from being murdered. I’m here to fight for truth, and justice, and the American way. The measure of a superhero is always his nemesis. Superheroes were born in the minds of people desperate to be rescued. Any father can relate to feeling like a superhero when you put a Band-Aid on your kid. The answers you seek shall be yours, once I claim what is mine. The fundament of a superhero is the guy in tights saving innocent people from bad things. It’s amazing how infrequently that seems to happen in superhero comics these days. I believe there’s a hero in all of us, that keeps us honest, gives us strength, makes us noble, and finally allows us to die with pride. Even though sometimes we have to be steady, and give up the thing we want most. Even our dreams. For there must always, always be a Zorro. And some day, when he’s needed, we will see him again. Superheroes don’t often get their powers in one fell swoop. It’s like superhero puberty. Someone must have ripped the ‘Q’ section out of my dictionary, ’cause I don’t know the meaning of the word ‘quit’. You can take away my suits, you can take away my home, but there’s one thing you can never take away from me. 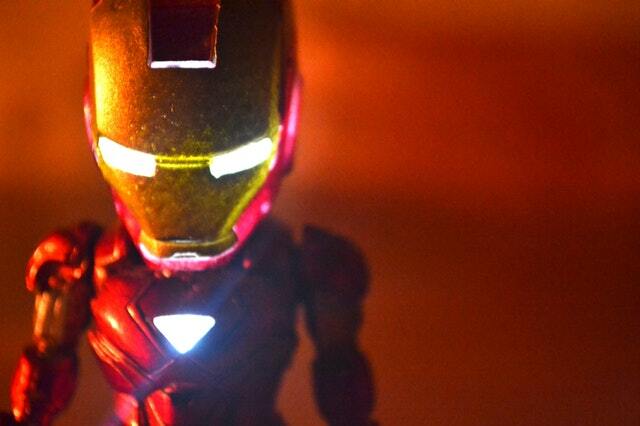 I am Iron Man. I hear everything. You wrote that the world doesn’t need a savior. But every day I hear people crying for one! I’m never quite cool, if you know what I mean. I’m basically the worst, best superhero. The future is worth it. All the pain. All the tears. The future is worth the fight. This. This is what I am. This is who I am come hell or high water. If I deny it, I deny everything I’ve ever done. Everything I’ve ever fought for.